Books and items dealt with on this site and of interest to visitors are available as indicated at the prices shown. The figures quoted in U. S. funds include packing and postage. Orders received through PayPal or direct by cheque or money order will be shipped immediately upon clearance. Payment by cheque or money order in equivalent currency for mail-in orders are accepted subject to the clearance provision previously noted. See Contact me for mailing address. Extensive research, minute books, correspondence and documents were the basis of this book that analyzes the socio-economic and cultural implications of this military experiment in national welfare. The result is a vibrant history of the lives of more than 11,000 children of rank-and-file soldiers of the British Army. Publisher: Black Cat Press, 1997. This children's book is a mixture of fantasy, fiction and fact for children of all ages. Award-winning artist Bill Slavin's illustrations perfectly complement the stories. Publisher St. Martins Press, 1987. Publisher: Robert Hale and Sons, 1987. Publisher: Leo Cooper in association with Secker & Warburg, 1984. This book is the story of boy soldiers in the British and Canadian armies. Publisher: W. H. Allen, London, 1975. A biography of the most successful policeman of his day and head of MI5, the British security service. Sillitoe had an international reputation as a crime fighter. His investigation of diamond smuggling operations was the model for Ian Fleming's novel Diamonds are Forever. 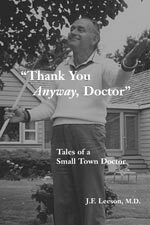 Subtitled 'Tales of a Small Town Doctor', this is a memoir of delight, enchantment and pleasure. It is a fund of anecdotes, fresh and compelling, without patronizing, or at the expense of anyone. Pleasure and satisfaction are guaranteed. The proceeds from sales of this book go to the Northumberland Hospital Foundation. Specification: 50 pp in an 8.5" x 11" format with a cirlux binder and soft covers. 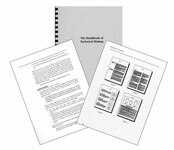 This book was written and published for a three-day course on technical writing delivered to over 2500 engineers and scientists during a ten-year period. It deals with the use of language, research, writing and editing, procedures, specifications, manuals, letters and memoranda, how to deliver oral reports, and provides a guide to technical publishing. The illustrated publication comes with exercises, answers and a comprehensive index. Specification: 125 pp in an 8.5" x 11" format with a cirlux binder and soft covers. 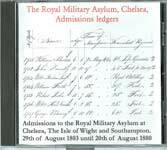 This record of admissions of boys and girls to the Royal Military Asylum from 1803 to 1880 in the case of male entrants and from 1803 to 1847 although some data for the female students is missing from the records. This data, which includes ages, parentage, regimental unit and other fascinating data will be invaluable to anyone engaged in genealogical research. 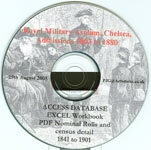 The data is available on a CD and comes with precise instructions of how to gain access to its content. P. Goble estimates that the descendants of these RMA children from 1903 to 1880 number about two and a half million people. 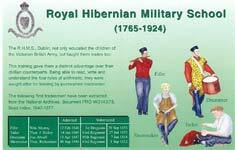 Peter Goble, researcher and artist, has re-created images of the famous Royal Hibernian Military School (1765-1924) that once occupied premises in Phoenix Park, Dublin, and became a model for other military schools. Goble has designed this unusual limited edition post card that will appeal to military history buffs. It is available in packets of one dozen, two dozen and larger quantities on demand. Supplies to commercial outlets specializing in militaria by arrangement. 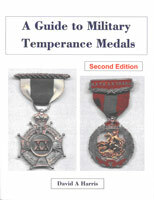 This second edition of author David Harris' popular guide to military temperance medals includes a wealth of new material. Enlarged in size, scope and pages from the first issue, Harris has drawn on the knowledge and expertise of numerous specialists in the field. New research in the records of the Army Temperance Society (ATA), the Royal Army Temperance Society (RATA) and the Royal Navy Temperance Society (RNTS) has resulted in a more complete treatment of temperance medals than any previous treatment of the subject. New plates both in colour and black and white, anecdotes and a large number of regimental medals add to the extraordinary history of the temperance movement in the British Army and Royal Navy. 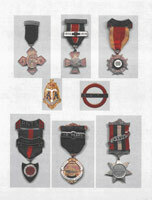 The book will be a welcome addition to the library of any collector of military medals. Free packing and mailing in North America. A number of rare books are available and are described on a separate page. When you click Checkout on that page, you will return to the Checkout area below. Payments are handled by PayPal's secure site. All major credit cards are accepted as well as payment using your PayPal account.